Video Inspection technology helps us pinpoint problems and aids in the diagnoses of current water well conditions. 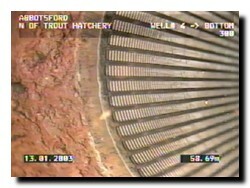 Precision Service & Pumps down-hole Water Well Video Inspection provides accurate visual inspection of a wells interior. Precision uses a WELL-VU DVCC 1000C Viewing Inspection Color Camera for down-hole water well video inspections. 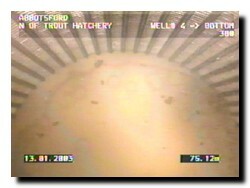 The Viewing Camera has significant improvements over some other Well Cameras available in the Down-hole Marketplace. 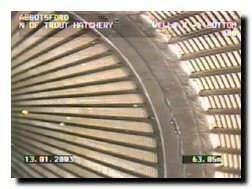 It uses a single camera module that tilts under operator control to look down the bore hole or at the casing wall. It can be rotated 360 degrees, continuously to inspect the entire diameter or casing joint. methods of well inspection can be avoided. This technology helps to pinpoint problems, diagnose well condition, and confirm well construction details. Precision Service & Pumps inspection system is suitable for water wells, bore holes and many other service applications. This camera work is very effective in showing the state of a well before (pre) rehabillitation and also showing the conditions after (post) rehabillition work is completed. After the well inspection is complete, the full range of Precision Service & Pumps well services are available to clients to correct any problems that may have been revealed by the inspection. A copy of the video camera inspection is left with the client along with any and all other inspection data for thier records and to maintain a well history log. 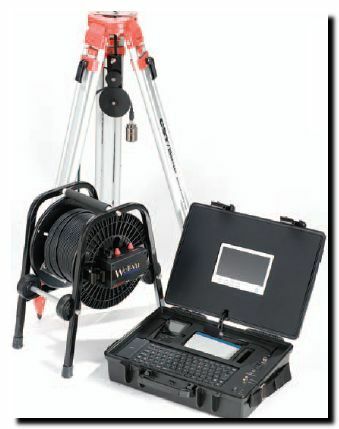 To learn more about Water Well Camera Services, click the link below.